Need help getting a lithium battery shipment out the door? The HAZMATEAM Lithium Battery Shipping Guide summarizes lithium battery classification, package marks/labels, documentation and packaging requirements. CLICK HERE TO DOWNLOAD the free HAZMATEAM Lithium Battery Shipping Guide (pdf). NOTE: Some browsers may not support downloads; if this happens try switching to another browser. For best results use Adobe Acrobat Reader. If you have been using the IATA Dangerous Goods Regulations (DGR) for the past 3 years, the above restrictions are nothing new, as 49 CFR has finally caught up with the international regulations. 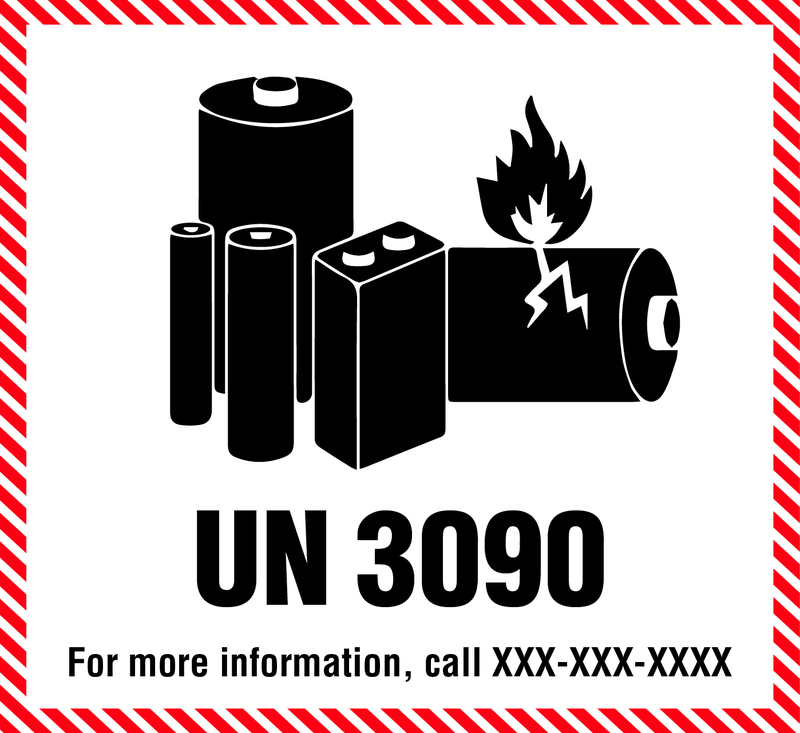 This new package marking requirements for UN 3480 is similar to the ground/rail/vessel marking requirements for packages containing small non-rechargeable lithium metal batteries without equipment, UN 3090. Small lithium ion cells have a maximum watt hour rating of 20 Wh and small lithium ion batteries have a maximum watt hour rating of 100 Wh. The HAZMATEAM LITHIUM BATTERY SHIPPING GUIDE summarizes package marking and labeling requirements for all sizes of rechargeable and non-rechargeable lithium batteries shipped all modes of transport. HM-224I provides a new exception for UN 3480 for medical devices. These batteries are allowed on a passenger aircraft if the intended destination of the cells or batteries is not serviced daily by cargo aircraft if a cell or battery is required for medically necessary care. These batteries are also exempt from 30% maximum state of charge limitation. Both exceptions require an approval from PHMSA. See 49 CFR 173.185 (g) for this requirement. Hybrid Batteries. Lithium battery technology continues to evolve. Batteries that contain both lithium ion cells and lithium metal cells (we will call these "hybrid batteries") must be shipped as UN 3090 or UN 3091, as appropriate. This is described in IMDG Code (Amendment 39-18) Special Provision 387 and IATA DGR (60th Edition) Special Provision A213. Further, these special provisions indicate that in order to ship these batteries as "small" lithium metal batteries, the total lithium content of all lithium metal cells contained in the battery must not exceed 1.5 grams and the total capacity of the all lithium ion cells contained in the battery must not exceed 10 Wh. Small lithium metal battery requirements are described in Section II of IATA DGR PI 968, 969 and 970 and in IMDG Code Special Provision 188. US DOT, 49 CFR, has not yet published any rulings on this topic - we do anticipate this update in early 2019. IATA Declaration. The declaration appearing in Section 8 of the 60th Edition (2019) of the IATA DGR has been updated. The updates are minor: the word "risk" has been replaced by "hazard" and the following portions have been removed from the form: "title of signatory" and "place". The old version of declaration may be used until 31-December-2024 (see IATA DGR 8.1.1.1). The declaration examples in the 2019 HAZMATEAM Lithium Battery Guide reflect the updated declaration form. IATA Emergency Response Drill Codes. ERG Code shown in Column N of the IATA DGR, for all lithium battery entries has been changed from "9FZ" to "12FZ". 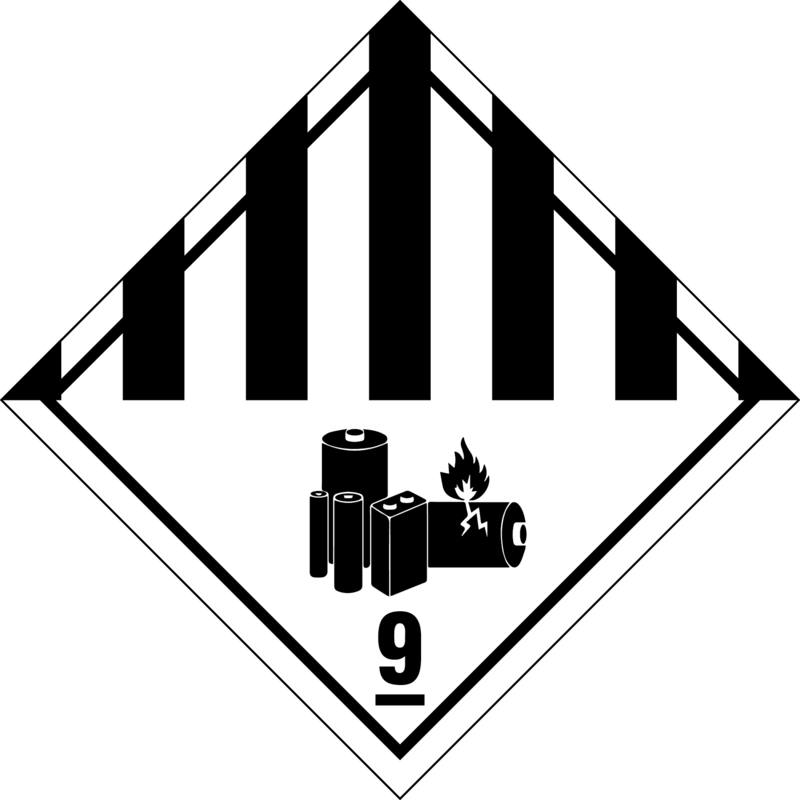 This reflects a change to identify that the inherent hazard for lithium batteies is not "9 - No general inherent risk" and a new drill number "12-Fire, heat, smoke, toxic and flammable vapour", was adopted. Lithium Battery Marking transition period is over. The following two Lithium Battery markings for small and medium lithium batteries are obsolete on January 1, 2019. If you use these old CAUTION! markings, your package will get rejected by the carrier!! When required, you can only use the marks below on package containing small and medium lithium batteries. Please refer to the HAZMATEAM Lithium Battery Guide for use of these markings. Note: effective 1-Jan-2018 IATA, Section 7.1.5.5.2 indicates the UN and number should be at least 12 mm high. 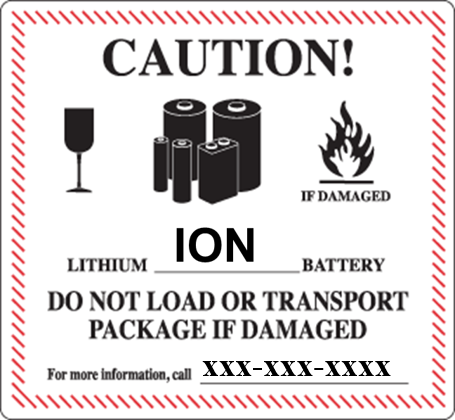 If your package of lithium batteries requires a Class 9 label (all fully regulated packages and Section IB of IATA PI 965 or 968), you must use the Class 9/Lithium Battery label below. If you use the standard Class 9 label (without the burning battery illustration), your package will be rejected. Cells and batteries packaged according to PI 965 Section II or 968 Section II cannot be packed in the same outer packaging with other Dangerous Goods. Effective 1-Jan-2019, all air, ground & vessel consignments of more than 2 packages of small lithium batteries contained in equipment must be marked with the lithium battery handling mark. 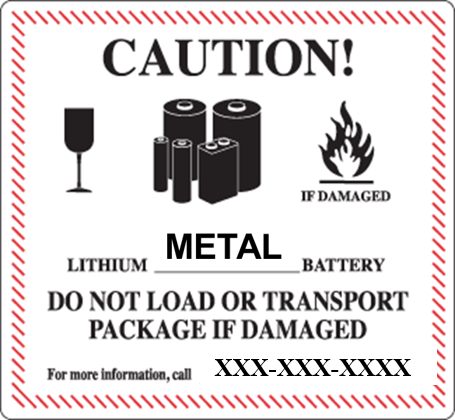 The March 18, 2019 version of the HAZMATEAM LITHIUM BATTERY SHIPPING GUIDE provides a summary of these updated regulations, including illustrations of package marks/labels, Dangerous Goods Declaration form examples, package testing requirements and emergency response information. March 18, 2019 … Updated to reflect HM-224I. October 21, 2018 ... Updated to reflect 2019 (60th Editiion) IATA DGR and 2018, Amendment 39-18 of IMDG Code. Shipping paper examples updated to reflect new IATA declaration format and hybrid battery description. November 28, 2017 … Updated to reflect 2018 IATA DGR. Sections added to the Guide: Package performance testing requirements and Emergency Response requirements. We also doubled the number of shipping paper (BOL and declarations) examples and re-formatted the battery size definition sections for clarity. March 31, 2017 … Incorporation of HM-215N following the re-release of the final rule on March 30, 2017. March 15, 2017 … Incorporation of 27-Feb-2017 DOT Notice. Also, updated to clarify use of address labels on packages. Training is required if you prepare a shipment of lithium batteries for transportation. HAZMATEAM offers several online and classroom lithium battery courses. The course you need is dependent upon which lithium battery you ship, the size of the battery and mode of transport. The grid below summarizes the online and classroom Lithium Battery courses offered at Hazmateam. * The classroom version of TRANSPORATION OF LITHIUM METAL AND LITHIUM ION BATTERIES is also available at the HAZMATEAM Training Center.